It was a busy four days for both senior Silverbacks teams. Busy, but also relatively successful. The Silverbacks women had their first game this past Saturday against Chattanooga FC at Atlanta Silverbacks Park. They can best be described a well coached, well organized, talented team. Evidence of this is the 4 goals they scored in the second half to win 4-0. Scoring 4 goals alone is impressive, but the way the goals were scored made it even more impressive. The goals mainly involved great team play ending with seemingly impossible shots finding their way into the net. Between the fantastic goals and the brilliant defensive performance it truly was a sight to behold. It seemed like every time Chattanooga had a free kick, the ball never got past the wall. It was a fantastic game and if you can make it to a women’s game by all means, go! Maybe if they can draw a big enough crowd, the staff at Silverbacks Park will turn on the scoreboard and use more than one speaker for the sound system (they should be doing that regardless, but that’s a story for another day). The night following the women’s dominating performance the Men’s team were in Durham taking on Tobacco Road FC. 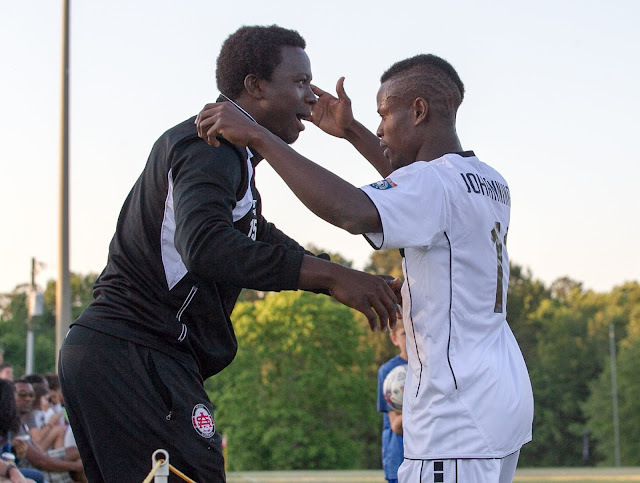 Gabriel Obatola opened the scoring for the Silverbacks by scoring in the 44th minute. The Silverbacks were unable to score a second goal, which wasn’t too much of a problem until Tobacco Road were awarded a penalty late in the game, which was scored by Ronnie Bouemboue. 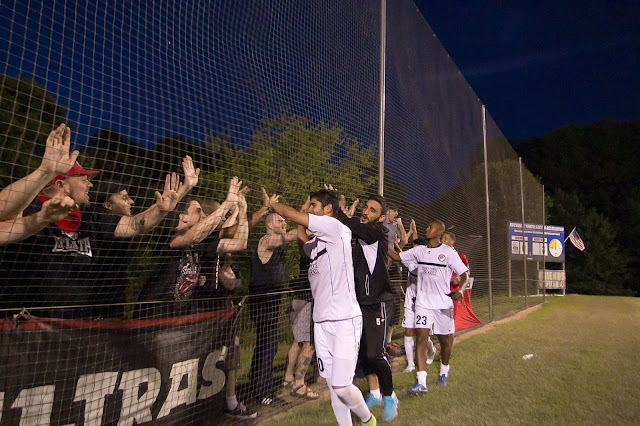 The Silverbacks then found themselves in a head to head battle for first place with Carolina Railhwawks NPSL just two days later in Cary. With both teams level on 4 points but the Railhawks having a slightly better goal difference, the Silverbacks needed a win to bring themselves back to the top of the table. Just two minutes in, the man in form Pedro Polaz scored again to give Atlanta the lead. After that goal, the Silverbacks never looked back and went on to win 1-0. The game was broadcast on Periscope by a Railhawks fan in attendance, and it was watched with great interest by many Silverbacks fans, as well as injured player Kemar Brown. A fan asked Kemar how long he would be out for, and Brown replied that he had just taken his boot off and that he hopes to be ready for the home opener June 4th against Myrtle Beach. The men’s team have no games this weekend, but the home opener on June 4th is fast approaching so make sure your schedule is clear and you have your ticket ready because it’s bound to be fun. Meanwhile, the red hot Women’s team will be in action, traveling to Nashville to play FC Nashville Wolves. The Wolves fell 1-0 to Memphis Lobos at home last Saturday, perhaps Atlanta can keep their perfect record intact. Their next home game is June 10th against Gulf Coast Texans, which will be a doubleheader with the men’s team who will be playing FC Carolina Discoveries. If you can, make it to Silverbacks Park early on the 10th for the women’s game and see if they can deliver a convincing performance as they did against Chattanooga. 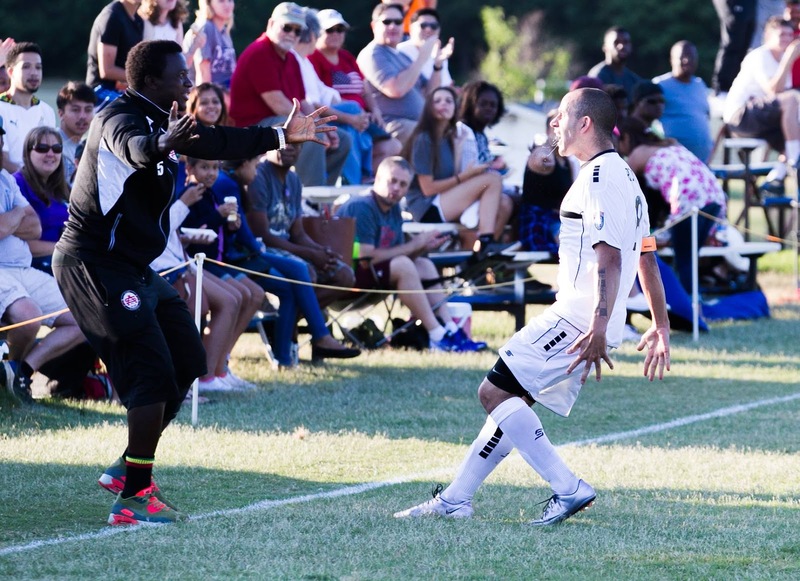 Wednesday night, the Silverbacks were knocked out of the US Open Cup 2-0 by Reading United. The lack of scoring chances, subpar officiating, injuries picked up by a few players, and the fact that there would be no road trip to Chattanooga left Silverbacks fans with a terrible taste in their mouths. While Silverbacks fans accepted that victory was not guaranteed, they did not expect to be left in the dust as they were that night. Two goals coming from Khori Bennett and Frantdzy Pierrot, as well as Atlanta’s lack of offense were enough to knock the Silverbacks out of the US Open Cup. 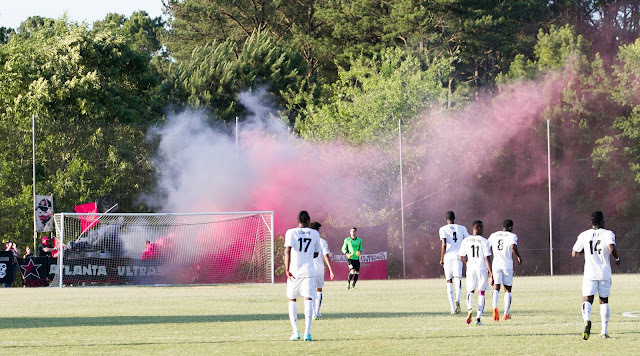 With the wound still fresh from US Open Cup elimination, there was a collective feeling amongst Silverbacks fans that the match against Georgia Revolution would be a tough game to win. They couldn’t have been more wrong as the Silverbacks went on to win 3-0 on the road in Conyers. Westside 109, Atlanta Ultras, as well as, other fans spread out across the wooden bleachers opposite the benches arrived in Conyers to make the game a home game for the Backs. Thankfully, every Silverback fan at RYSA Soccerplex was rewarded for their short drive out to Conyers with a dominating performance. Mitch Garcia scored the first goal with a brilliant free kick that ended up in the net at the left post, just out of the keeper’s reach. Johanning scored the second goal after a brilliant delivery from Pedro Polaz. Johanning only had to tap it in and with it, the Silverbacks had their brace. The Silverbacks turned on the style for the third goal. Great team play and a breathtaking backheel pass gave Pedro a glorious opportunity to make it 3-0, sealing up a team hat-trick. Shortly after the fulltime whistle, a few Silverbacks fans and myself had a short talk with the Revs’ new owner. He insisted that the Revolution do have a good team despite the result. He said he would love to establish a tournament with the Silverbacks, the Revolution, Peachtree City MOBA, and Tormenta FC all participating. He also had very high praise for the Silverbacks. He said he had no idea what happened to the Silverbacks in Reading, but the team he saw Saturday night was completely different. He even went on to say the Silverbacks could “end up winning the (South Atlantic) conference” if they continue to play like this. The Silverbacks are off to a flying start in league play, however it is only one game. Being able to continue playing like they did in Conyers on Saturday night is of the utmost importance and will go a long way towards that potential South Atlantic Conference win. The next opponent in our path is Tobacco Road FC who started their season with a 2-2 draw against Myrtle Beach Mutiny. Tobacco Road FC will also have Georgia Revolution visiting them on Friday, before playing the Silverbacks on Sunday. The Silverbacks also play the Carolina Railhawks NPSL just two days after playing Tobacco Road in Durham. This makes it a bit more interesting all around. How will the squads be rotated for both teams? How much will fatigue come into play? Will being away from home negatively affect the Silverbacks? There are many questions surrounding this road trip for the Silverbacks that will be answered in due time. There are also many questions surrounding the Women’s team. Right now, all we know about them is the players’ last names and first initials, and that part-owner and the Silverbacks all-time leading scorer Iggy Moleka is the head coach. Fortunately, their first game is this coming Saturday against Chattanooga FC at Silverbacks Park. By the end of the game, all questions we have will be answered. Make sure to keep supporting YOUR Silverbacks, both men and women. The Lamar Hunt US Open Cup is upon us once again. For the first time since 2008, the Silverbacks will play in the first round of the tournament. The team’s first competitive match of the season will take place on Wednesday, May 11 in Reading, Pennsylvania. Their opponent will be Reading United AC. Founded in 1995 as the Reading Rage, Reading United AC plays in the Mid-Atlantic Division of the PDL. They are affiliated with Philadelphia Union of MLS and have been since the 2010 season. Reading United have seen some their former players go on to respectable careers in MLS whether it be with the Union or elsewhere. A good number of current MLS players such as Ray Gaddis, Andrew Wenger, C.J. Sapong, Luke Mulholland, and Deshorn Brown have played for Reading United in their younger days before going on to bigger and better things. For a PDL team, it’s fair to say that Reading United have a certain prestige to them, not just because of the players they’ve had in the past, but also because of their record in the US Open Cup. They have qualified for the US Open Cup 10 times in their history, 8 of those appearances coming consecutively from 2009-2016, and have made it out of the first round every year since 2012. In what can only be described as their biggest accomplishment in the US Open Cup, Reading defeated USL club Harrisburg City Islander 1-0 in the second round of the tournament in 2013, their first victory over a professional team, and their only one to date. This 2013 upset led to the first of their two appearances in the third round, the second one coming in 2014 after beating GBFC Thunder of the NPSL in the second round. Both appearances ended in losses to New York Red Bulls in 2013, and Rochester Rhinos in extra time in 2014. Reading United’s roster is solely composed of College players. It is an interesting roster because 11 of the 28 players on the roster come from foreign. 8 Countries and ten states are represented. 2 Reading players have ties to Georgia; University of Kentucky sophomore midfielder Tanner Hummel is from Kennesaw, and a forward from Cambridge, England named Jake Simpson is a Sophomore at Young Harris College. It is the first competitive match of the season for both clubs; they will both begin league play May 14th on the road. The match will be streamed on Youtube by Reading, and there will be a watch party at Elder Tree in East Atlanta, come out if you want to watch with other Silverbacks fans. Saturday afternoon the Silverbacks played to a 2-2 draw with local amateur side Gladiadores FC. 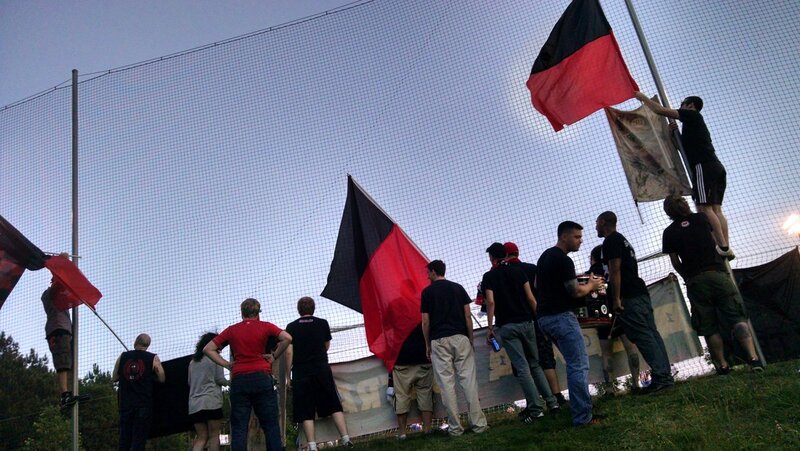 By preseason standards, the crowd at Silverbacks park was fairly decent. 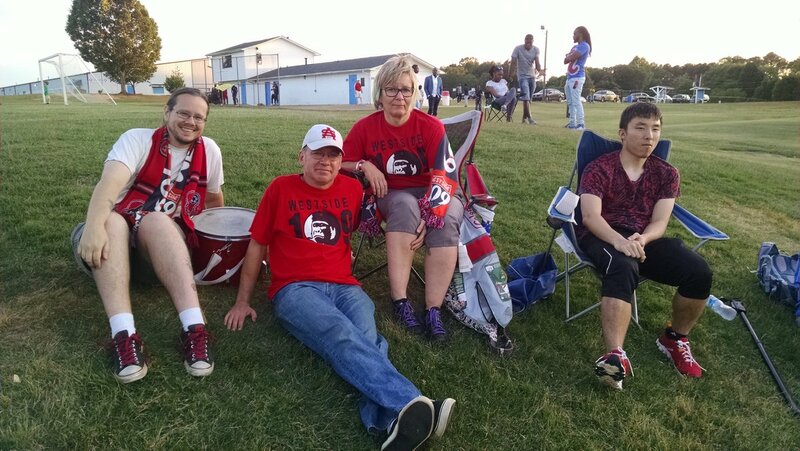 Members of Westside 109 and the Atlanta Ultras, as well as,other fans donned Silverbacks jerseys from seasons gone by came out to support the Silverbacks and their new players. Gladiadores FC scored the first goal on a shot just outside of the 18 yard box when a ball fell to the Gladiadores player who let it fly into the net. The Silverbacks attack seemed a little bit out of sync at the start of the match, and it did not help the opposing goalie made several good saves in the first half. Towards the end of the first half, the Silverbacks attack woke up. The passing was very clean and wingers were providing great crosses to the attackers in the middle but they could not score before the break. The Silverbacks attack continued to look sharp in the second half. Their first goal of the day came after a shot was stopped by the Gladiadores keeper but the rebound fell to a Silverbacks player that made no mistake. Gladiadores were not done scoring as a delivery from a set piece met the head of a Gladiadores player and went into the net to make it 2-1. In what could only be described as a Manuel Neuer impression gone horribly wrong, the Gladiadores keeper was well outside of his box played the ball, was dispossessed and immediately scored on. After a steady pattern between no precipitation and a light rain, it really started to pour towards the end of the match, many fans came prepared with umbrellas but eventually it got to the point where they could no longer brave the storm and took off running. The Atlanta Ultras kept on singing and jumping around in the rain. Despite the goals conceded, and a few missed opportunities, the team looked pretty good from my point of view. The May 11th US Open Cup Match against Reading United is sure to be interesting. Make sure to come to Elder Tree Public House in East Atlanta to watch it with other Silverbacks fans.